D's Hostel now consists of two properties. The Main property has three rooms each with its individual air conditioning. Two of the rooms have their own in-suite bathroom. One is a private room with a Queen bed and sells at 45usd per night. The second room is a four bed, two bunks, sells at 15USD per bed per night. The third room is a private room with a double bed and sells at 35 USD per night. It shares the main Bathroom in the home. The Property, Guest House, is set minutes away from the major attractions in town. The second property, the Hostel, is newly renovated and provides a six bed Dorm and a 10 bed Dorm both without Air Conditioning. They are cooled by Fans and sell at 12.50 USD per bed per night. This property also has three individual private rooms with its ensuite bathroom and are Air Conditioned. They sell for 35USD per night per room. These rooms have double beds. 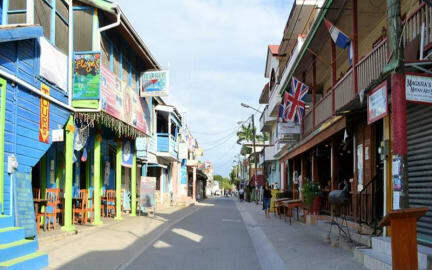 D’s Hostel is located on West Street, about 1 minute or less from D's Guest House where the Main Office is located at the end of the main street ( Burns Avenue ) in San Ignacio. They are literally minutes away from the downtown restaurants and bars, the local market and the Welcome Center where the buses and other public transportation are located. Perfect for being close to the hustle and bustle of the town yet far enough to be away from the noise. Directly opposite of us is the most famous restaurant in town, The Guava Limb Restaurant. 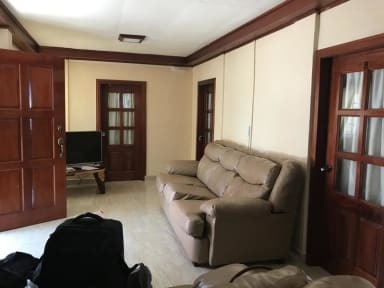 D's Guest House has a large living room with comfortable sofas and cable TV and a full equipped kitchen and dining. The kitchen has refrigerator, microwave oven, toaster, coffee maker, cutlery, pots and pans. There is also a large shared bathroom. The Guest House provides all linens and also towels if needed. D's Hostel mimicks D's Guest House, with the fully equipped kitchen and a living room on a smaller scale. Check in from 13:00 to 19:00. Cancellation policy: 72 h before arrival. Payment upon arrival by CASH ONLY. Reception is open from 8:00 till 19:00.